With heavy inflows into Bahuda river, several areas of Ichapuram Municipality and surrounding villages got inundated and the road network to Odisha had been cut off. SRIKAKULAM: After being hit by the severe cyclone Titli, people of Srikakulam district are now facing floods, with river Vamsadhara, Mahendra Tanaya and River Bahuda flowing above danger mark. Under the influence of cyclone Titli, heavy rains lashed the upper catchment areas of both Vamsadhara, Mahendra Tanaya and Bahuda in Odisha. Gates of the dams on both the rivers were opened and water was released downstream. At Gotta Barrage on Vamsadhara, flood water is being released at a discharge rate of 1.67 lakh cusecs. With heavy inflows into Bahuda river, several areas of Ichapuram Municipality and surrounding villages got inundated and the road network to Odisha had been cut off. 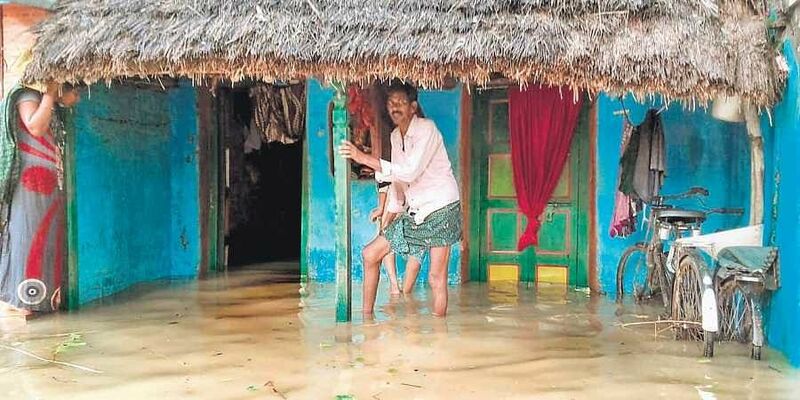 Rattakanna, Loddaputti, Jagannadhapuram, Masakahapuram, Innespeta, Dharmapuram and 24 other villages in Ichapuram mandal were submerged by flood water. With increasing inflows, officials of Bagalatti dam in Odisha opened the gates and released the water downstream. “We had to spend sleepless nights, as the flood water entered our houses last night. The flood water has not receded even now,” said S Triveni of Birlangai Road in Rattakanna village of Ichapuram mandal. On being alerted by her, the rest of her family ran out of the house to a safer location. The situation was no different for several hundreds of families in the villages abutting Bahuda river. Many people were not even able to get food and water for more than 12 hours. Further, the power supply was cut off, with several electrical poles getting uprooted during the cyclone. Later in the evening, revenue officials, led by Ichapuram tahasildar M Suresh, distributed 10 kg of rice and food packets to each of the flood-hit families. Similarly, several villages at Sompeta mandal, along the course of river Mahendra Tanaya in the district, were also flooded. Villages in Hiramandalam, Pathapatnam and several villages abutting the course of Vamsadhara river were also flooded. Road connectivity at several places was cut off. With heavy rainfall, all the 22 gates of Gotta Barrage on Vamsadhara were lifted and water was released. Similarly, water was released from Narayanapuram Anicut. The standing crop in several thousands of acres got submerged in the flood water and the real extent of crop damage can only be assessed once the floodwater recedes. Relief camps were set up in Metturu, Unabadra, Karlem, Masingi, Pedda Sankili and Jaganadhapuram.